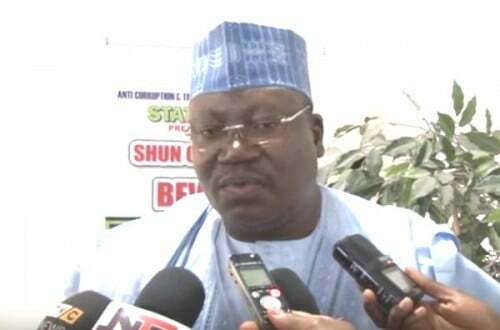 Senate Leader, Ahmed Lawan says history of presidential candidates and their integrity will determine the outcome of the 2019 election. Lawan speaking at the APC zonal stakeholdersâ€™ meeting in Bauchi on Sunday said despite claims from opposition parties, Buhariâ€™s in a space of three and a half years rule has gained trust of many Nigerians. According to the senate Leader â€œAPC will be selling character and integrity to Nigerians come 2019.
â€œI want to say that the 2019 general elections will be determined by integrity; the 2019 general elections will be determined by the history of candidates. â€œWe know what other candidates of the other parties were before; we know what they didnâ€™t do for us; we know what they did to Nigeria, in the area of destroying Nigeria. They privatised our common patrimony; they sold everything that was government to themselves; and they also intend, if they come back, God forbids, to sell the remaining things to themselves. â€œWe are not going to accept this; President Muhammadu Buhari never desires or intends to do anything like that. What ever he does is for the interest of Nigeria; whatever he does is for the future of Nigeria. â€œAnd we believe that Nigerians know this facts and therefore we donâ€™t have to do so much in the area of campaign. â€œI want to tell you that there are so many people who, before this time, did not believe in any political party. But after seeing what President Muhammadu Buhari has done, with the little resources at his disposal across country, have now decided to give their support for President Buhari even when they donâ€™t believe in a political party.